The brand will be used for souvenirs, pet products and stationery. 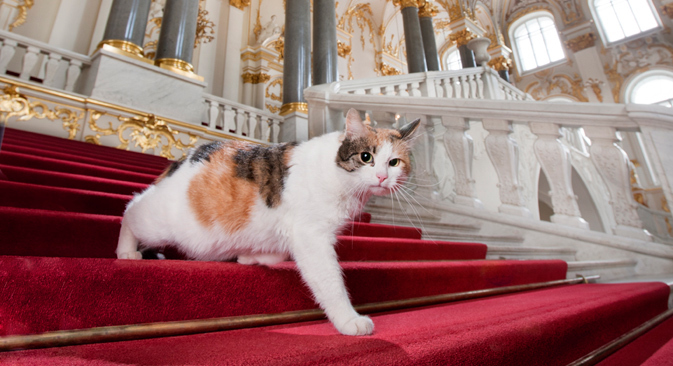 The State Hermitage Museum in St. Petersburg has filed an application with the Federal Service for Intellectual Property (Rospatent) to trademark the phrase "Hermitage Cat." The trademark is to be registered for 15 classes of goods and services – souvenirs, pet products, stationery and educational products as well as food products. The Hermitage's own online store already sells the souvenir collection Hermitage Cats, based on the works of art from the museum's collection. According to the website, it is based on three themes – cats from woodblock prints by Japanese artist Utagawa Kuniyoshi (mid-19th century), the statuette of the Egyptian cat goddess Bastet (5th century BC) and the bronze figure of an Iranian cat from the late 12th century. The provenance of the Hermitage Cats dates to the 18th century, when cats started to be officially kept on the palace grounds. Now each of the cats has a passport, a veterinary certificate and the right to move around the Hermitage. When the number of animals exceeds 50, the Hermitage traditionally announces the distribution of cats beyond the limit. First published in Russian in Moskva news agency.